Gounod’s meditation on J.S. Bach’s Prelude in C Major, arranged for string orchestra/quartet. The PDF contains parts for violin III (doubling that of the viola) and double. Click here to listen to a recording of the piece. 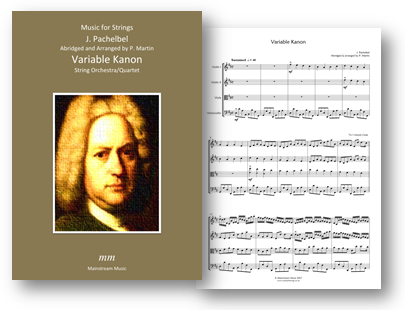 Pachelbel’s much loved Kanon, often requested as a processional at weddings, can last over six minutes, depending upon the tempo chosen. This abridged version, lasting just four minutes in total, can also be shortened to three minutes, two minutes or just one minute, dependent upon the length of the aisle. The ‘walking bass’ cello part helps ease (though not greatly) the cellist’s tendency to lose the will to live midway through the performance. The optional smaller notes in the viola part are added to aid those violists lacking a head for heights and for those listening, who find anything above G on the viola’s A string hard on the ear. 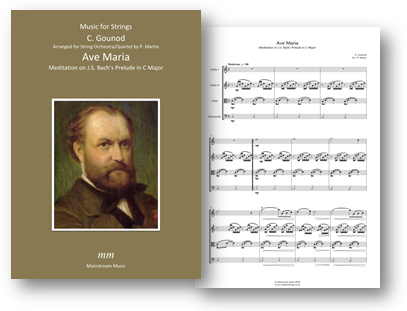 The PDF contains parts for violin III (doubling that of the viola) and double bass. Click here to listen to a recording of the piece.